For the holiday season I wanted to revisit my original Christmas Decorations post. This was originally posted back in December 2015 (holy hell I didn’t know I’ve been doing this for three years). So, let us Deck the Halls, again. My first memory of being happy when seeing Christmas decorations is going to my grandparents house, Nana and Pop, for our family Christmas Eve dinner. As they got older and the grandkids started having kids the timing changed slightly so it wasn't so regimented on Christmas Eve but we always got together as an extend family for a meal. I remember pulling into the driveway of Nana and Pop's old ranch-style home in Herndon and seeing what had to be the biggest (or I believed it was the biggest) Santa Clause face I've ever seen hanging on the side of the house. It wasn't anything fancy. In fact, it was big and plastic and probably one of the least classy Christmas decorations you can think of but that didn't matter to me. I loved it and knew that one day I wanted to have it for myself. 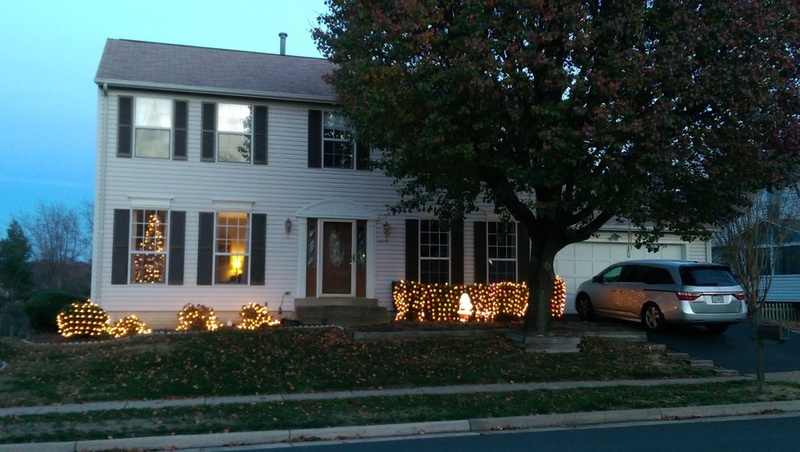 Ever since then I have loved decorating whatever house I live in for Christmas time; be it my childhood home with my parents, my apartment in Stafford, our townhouse in Falls Church, or our current home. I wanted to share with you some of my Christmas decorations. I never go too over the top but I do try to keep it festive and classy. I'll share a brief story or two but most of this blog will be pictures of our decorations. I will tell a story about the first picture because it relates to the opening sentiment. You see, there was a running joke during our Christmas Eve gatherings at Nana and Pop where my Mom, Aunt, Cousin, and Sister would "claim" any nice gift that Nana happened to receive. The "claiming" of the gift was that particular relative stating that they wanted that item when Nana died. It was a joke that everyone was in on but I only staked my "claim" to one item. I always claimed that the big Santa head outside the house was mine. I would say this year after year. A few year's before Pop died he gave me one of his best Christmas presents. As it turns out he had been looking for a copy of that Christmas head to give me for a long time but wasn't able to find one. Instead, he decided to give me the next best thing, an antique Santa head. It is one of my prized possessions and I display it every year at Christmas time. When Pop did pass away I was about to get that big Santa head but my Cousin asked if she could take it. It seems her four girls (ages 12 and below) had also been very fond of the big Santa head and wanted to put it up at their house. In the spirit of family that Pop always displayed I let them take the Santa head for two reasons. (1) There was the condition that if the four girls didn't want or care of the Santa head any more than I would get it and (2) Pop had gone out of his way to find a Santa head just for me, so I'll always have that Christmas memory. The Santa head Pop gave me prominently displayed in our living room. Nana and Pop, as well as my Mom and my Uncle, were (are) collectors of Christmas houses and other related figures from the Department 57 line. These are little ceramic houses that are decorated from various time frames and story lines. You can get really into collecting these items (my Uncle has an entire Christmas tree that is designed with the sole purpose of displaying these houses) or you can be like me and just enjoy the look of a few of the houses. I had a few of my own then I inherited some more of the houses from Nana when she passed away. I love putting these up in our dining room as part of the Christmas decorations. This would usually have some cotton "snow" but Cece is tall enough to reach the top of the table now so that was left out this year. With adding Nana's houses I had to expand to to the top of the China cabinet. Our new house, unfortunately, doesn't have a fire place. This is something that we plan to remedy one day but until that day comes we will be hanging our stockings from the stair railing with care. Stockings from left to right: Ellie (with dog bones), Pig (it is a cat stocking), Rizzo (Ali-bear), and Cece (hand made by her Aunt Carrie). Mine is missing because we ran out of ribbon so my stocking is caring resting on the kitchen table. Over the past few years I have been able to put up two Christmas trees. The first contained all the family Christmas ornaments. For years, Nana and Pop gifted me the clothespin toy soldier ornament from Hallmark. I don't know if I have all of them but I have most of them. Between Rizzo and I (including those clothespin ornaments) and now including Cece we had enough ornaments to fill up and entire tree. The second tree was what I called the "street" tree. This tree was put in the front window and decorated in a color theme. One year it would be red themed which means it would have red and silver decorations. The next year would be purples so it would have purple and gold decorations. The last theme was blue and silver. This tree would be exclusively decorated in glass balls and other ornaments to look classy in the window of the house. The family tree was located in what is now Cece's playroom and we didn't want to mess with that so we cut our tree allotment down to one for this year and decided to put our family tree in the living room with a nice street view. Only the top half is decorated so Cece can't rip all the ornaments off the tree. Cece and Pig love to lay down together under the Christmas tree. Not wanting to leave the bar unattended, our booze must be dressed up for the season. The red wine is dressed up as an elf while my Scotch is pretending to be Santa Clause. The final touches are just a few lights and decorations outside the house. The bushes are covered in nets, Santa is illuminated, a reindeer stands next to him, the tree can be seen through the window, and a wreath is hung on the door. Nothing fancy just a little bit of holiday cheer. I hope you enjoyed this little tour of our Christmas decorations. What are your favorite decorations? Is there something you always have to display at Christmas time, no matter how ugly or tacky it might be?